Handling customer complaints in a food and drink business presents a number of unique challenges. This article is focussed on the handling of customer complaints faced by food and drink manufacturers, processors and distributors. Where possible I will try to focus on challenges unique to food and drink. This means that many of the challenges readers face on a day to day basis are ignored if it is felt that they are not unique to food and drink. If you think that there are challenges that I have missed please let me know. Many food and drink businesses have branded and private label sales resulting in incoming consumer complaints coming from different sources. There are the direct consumer contacts for brands coming from branded websites, facebook pages, contact centres, email and letter, the branded complaints fed back through retailers and complaints relating to private label products where the consumer complains directly to the retail brand owner. This wide array of complaint sources creates complexity in reporting, consumer and customer feedback and managing the various response time SLA’s which may be applicable. It is not uncommon for food and drink products to be sold in various pack sizes, through multipacks and in different formats through different channels. These different formats will often be produced on different lines and sometimes at different sites. Yet when a consumer complaint is received there may be sketchy information about the actual pack format making complaints tracking more difficult. A great quality product is shipped to customers distribution centres. Then the product is mishandled or damaged as it travels from distribution centre onto the shelf, or between the shelf and the consumers plate, in fact at any point up to the customer complaint. Yet there are many steps where the manufacturers are not responsible for the product but are responsible for damage caused by the retailer or consumer. How unfair. In larger food and drink businesses the same product may be produced at more than one site, yet unless accurate durability information from the customer complaints management process is available it can be hit and miss allocating complaints to the correct site, again messing up complaints tracking at site level. Many chilled products are frozen at home by consumers who may not freeze correctly, may freeze for too long or the product could be defrosted and refrozen. At some point after the various abuses the consumer gets around to consuming the product, takes issue with taste or texture and raises a consumer complaint. A variation on this theme is where the customer complaint relates to a product long delisted and based on the last production date there is no product left in the market that is within life. Manufacturers producing own label products rely on the retailers consumer care teams picking up the correct product as part of the retailers complaints handling process. These teams can be rushed, undertrained, indifferent and rather than take care and ensure the customer complaint is assigned to the correct product they assign the complaint to the most convenient product and move along to the next complaint, leaving the manufacturer to pick up a retailer admin charge, plus another complaint added to complaints tracking data for a product not supplied. Have I said before, how unfair! Where the consumer complaint relates to a foreign body and the site needs the foreign body to do a robust complaint investigation it is necessary to send out stamp addressed envelopes(SAE) to the consumer and hope for a response. On receipt of the foreign body back there is then the logistics of getting it from the customer complaints handling location back to the manufacturing site for investigation. This all takes time. Search “brazilian spider in banana ireland” to find the following video on the Independent website. Is this real or is it a spoof. Either way it is being viewed by a lot of consumers. Search “fly in mashed potatoes” to find the following article on the Daily Mail website. With the power of social media and the ability for social media posts to go viral very quickly there is a brand protection risk around these type of posts, whether they are true or fabricated. Most businesses will have service level agreements(SLA’s) in place with in-house or outsourced consumer careline teams. These SLA’s have deadlines for responding to customer complaints and a team’s ability to meet these SLA’s are often seen as an integral part of the customer complaints management process. Yet for complaints requiring investigation the time required for sites to complete thorough investigations can exceed the SLA’s. A catch 22 arise, continue to do a robust investigation and send a partial response to the consumer or wait until the complaint investigation is completed. It is hard to define all scenarios in the customer complaints management process, so some flexibility is required. This is where experienced consumer complaints staff equipped with state of the art customer complaints management software is critical to success. All of the challenges so far have been overcome, now the complexity of complaints reporting. 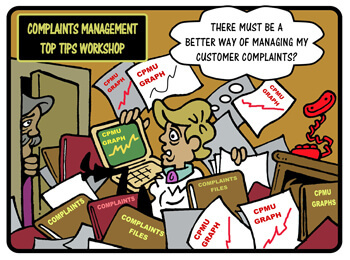 Some retailers require complaints per million units(CPMU), another requires complaints per hundred thousand(CPHTU), all have different reporting periods, each business has its own reporting. Without advanced business intelligence(BI) reporting a complaints handling team can spend too much time creating and manipulating spreadsheet based charts. If the consumer complaint relates to product quality then it is sensible that this should be reported against quality statistics for the manufacturing site, but what if the customer complaint relates to what is printed on the packaging, or some changes to the company logo and branding. Are these types of consumer complaints kept separate from the complaints that site management are responsible for. Is it up to Food Manufacturers to Tackle Obesity?